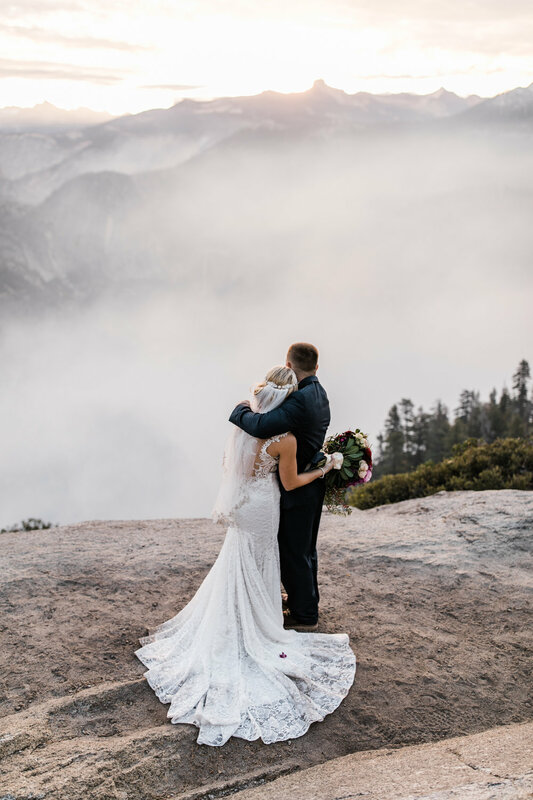 Tyson and Ky's intimate wedding at Glacier Point in Yosemite National Park is honestly a textbook example of the vision Callen and I had when we started this whole crazy thing. We had such a blast watching them take in Yosemite's beauty for the first time followed by even greater excitement during their first look. There's something special about convincing your favorite people to travel across the country to join you as you promise forever. The closeness of this group was so evident during this sunrise ceremony. And did I mention their sweet daughter had the most precious matching bouquet? I mean, cuteness level over 9,000. We got to hang out with this fun group and enjoy some of the most awesome cloud coverage into the morning before taking a brief intermission and meeting back up with just Tyson and Kyletha for some sunset portraits at Taft Point. 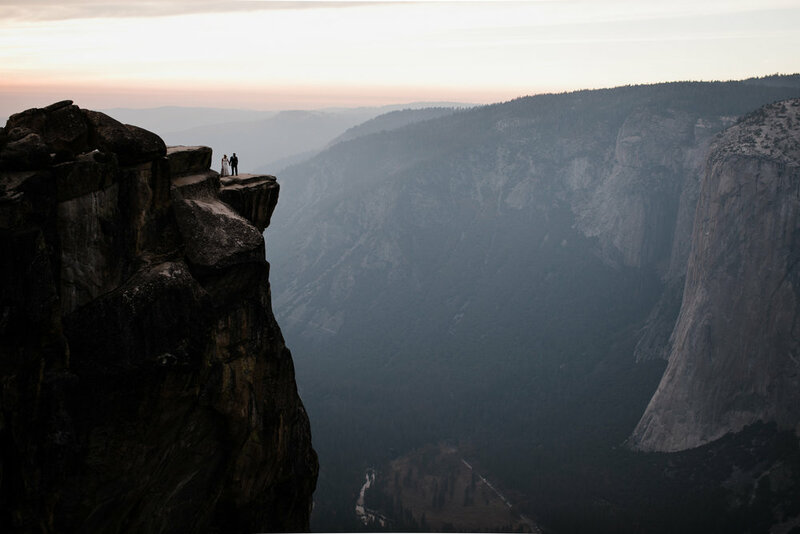 Taft Point is an adventurous couples' dream location. 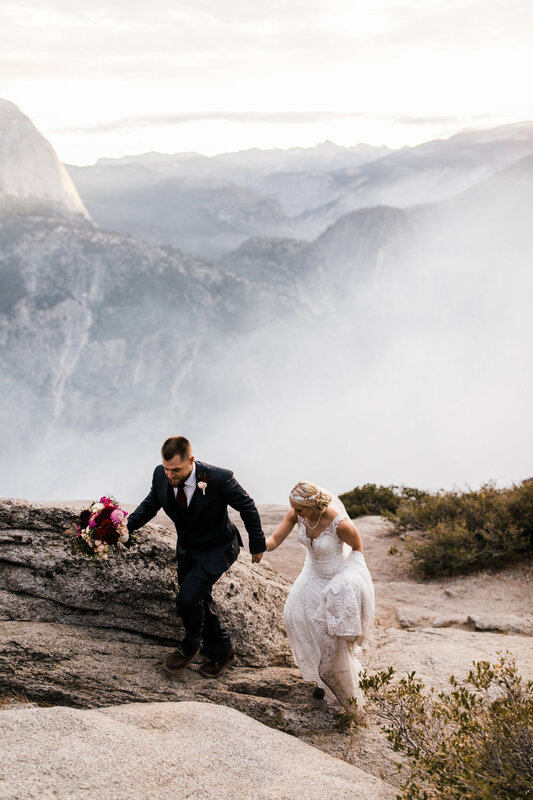 The hike-in is guaranteed to ombre a bride's dress into a granite grey, the views are spectacular, and the sheer nature of the cliffs is certain to up the adventure ante. We love hiking with our couples because of the sweet conversations it facilitates. Tyson and Ky shared their hopes and ideas for their future together and we are so grateful to get to work with such awesome people. We couldn't be more pleased with how beautiful this day was with these two!